Back again at Water’s Clough, what a joy that site is. 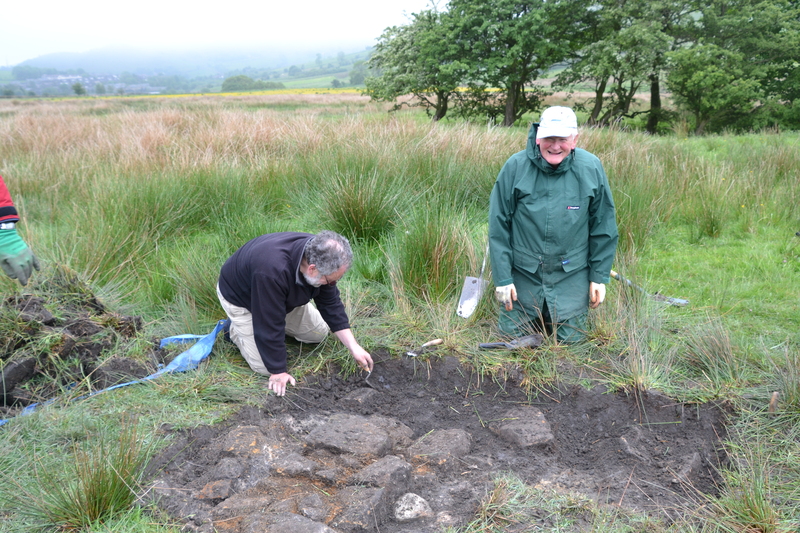 Phil and assistant (me) did geophyz there on the previous Monday and a lovely picture of complexity emerged. Based on this and some of the visible walling Norman planned more test-pitting, particularly where there appeared to be a large squarish building. To save you the bother of going backwards I’m posting the photo from that day again, where Sue, Rob, Mark and Eleanor stood at the probable corners. 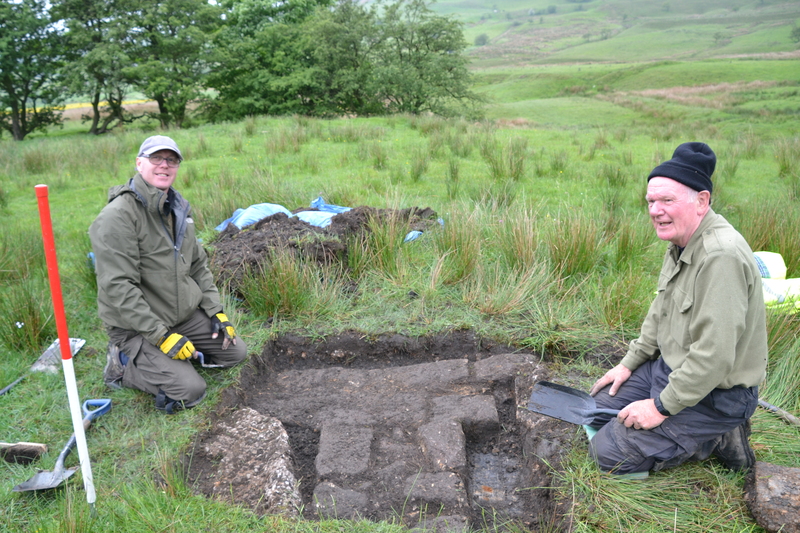 Before too long on this day you can see the work of two teams – Jacqui and Paul, and Nora and John, in exposing two parts of the wall on the south side. And soon with one part ready for its photo-call. 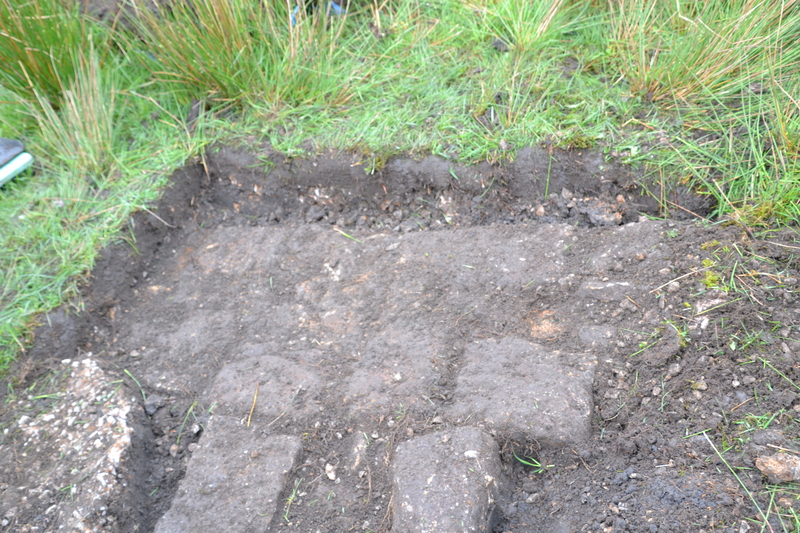 Here is the return at the NW side as it is beginning to be uncovered. There’s always time for lunch. 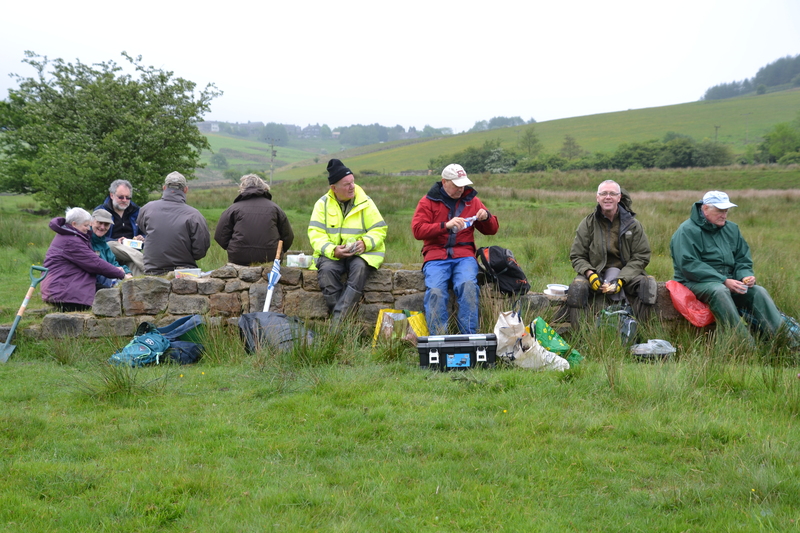 Below Norman, Mark and Jack are getting to grips with the NW return again – and before too long found the very edge of the wall. 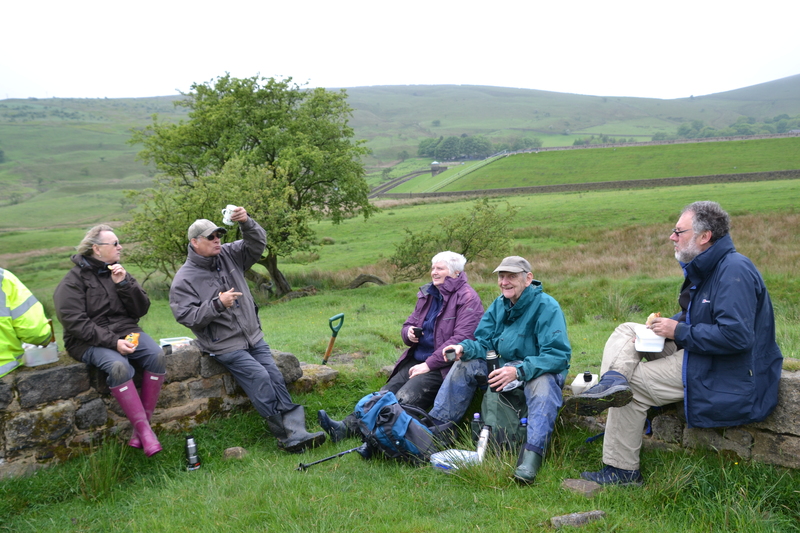 Meanwhile Paul, Jacqui, John and Nora met up in the middle and showed us a very fine wall indeed. At the SW corner Norman, Alan, and David are exposing the return although at this end the wall is somewhat robbed out. Here’s the cleaned up NW return with measure, looking truly wonderful! “I am beginning to get quite excited about the site. Our work on Monday showed that the ruined structure that we looked at last year belongs to a much larger complex of buildings. 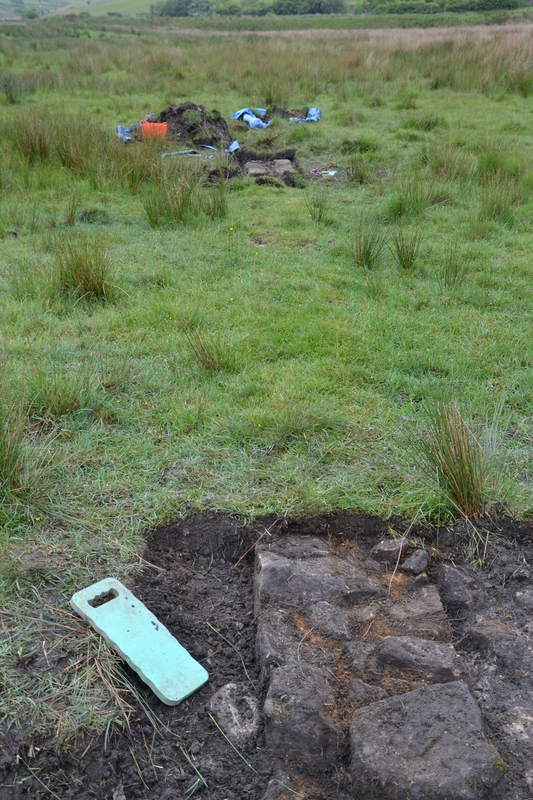 We confirmed, through geophysics and small hand-dug evaluation trenches, that a structure with similar wall construction (just over 50cm wide with an orange gritty mortar and well laid stones with a narrow core) runs 31.80 metres to the west of the ruin. It is slightly narrower than the ruin, with a width of 8.40 metres as opposed to 10 metres for the ruin. In places there were well-preserved foundation walls including a corner with a slight outside projection acting as buttress. 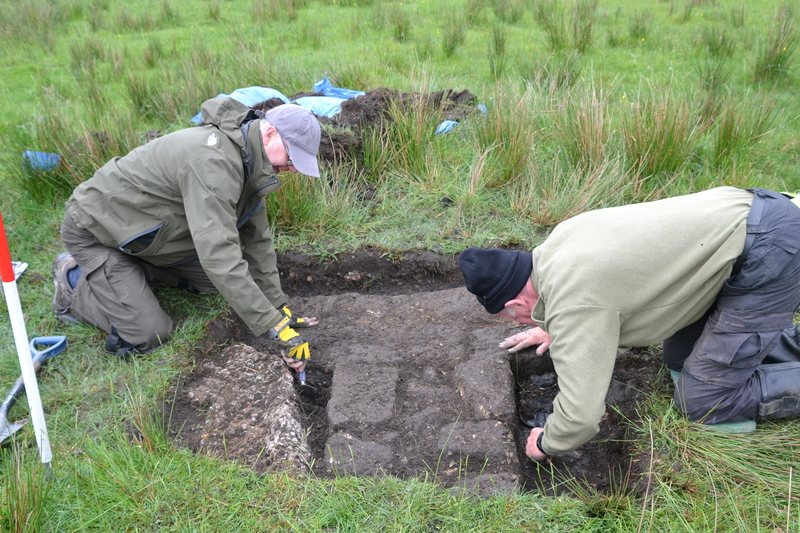 However, we also demonstrated that in many places the walls have been thoroughly robbed out, so that what appear to be drainage channels are actually robber trenches where wall foundations once lay. We could not locate a return for this long, narrow structure which runs right up to the ruin; however, it is possible that the return wall has been robbed out and is not easily identifiable. Frustratingly, there were no finds, floor surfaces, or even broken roof slates or architectural masonry. The scale and quality of build is remarkable. There are a number of earthworks associated with the site including a hollow-way leading down to a ford over the stream together with a series of impressive banked field boundaries. 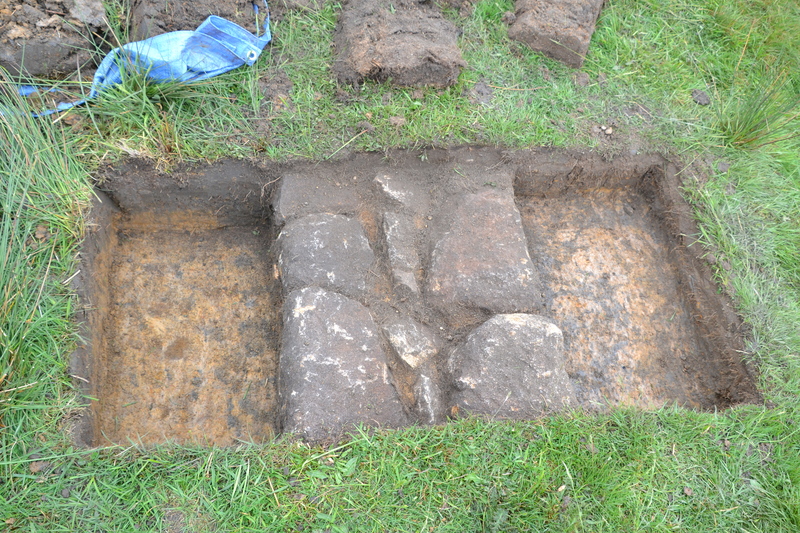 From last year’s evaluation we have hints of a wider network of yard walls and cobbled surfaces. Why is such a substantial structure not apparent on historic mapping? 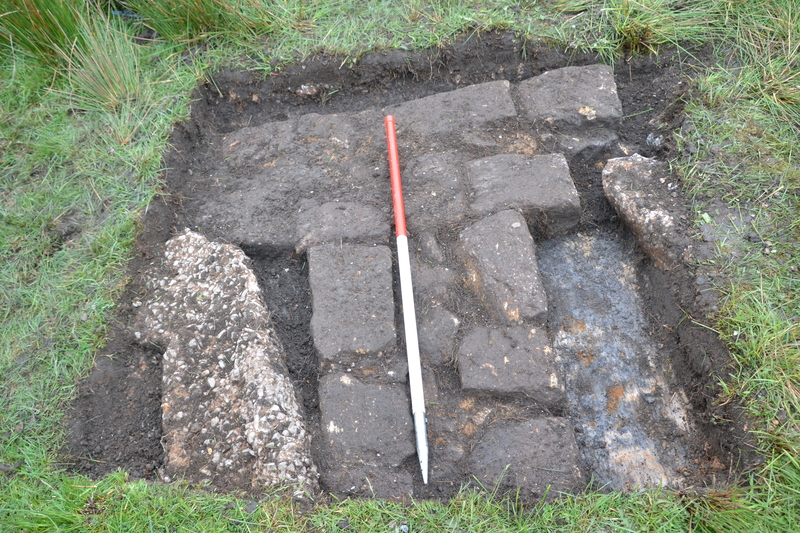 Taken together the evidence is pointing towards a late medieval origin probably associated with the monastic grange that is known to have existing at Friarmere, Castleshaw. This belonged to the Cistercian Roche Abbey, the remains of which can be visited near Doncaster. Sadly, most of the records for the abbey were destroyed during the Civil War siege of York in 1644. Looking at aerial photos, it is highly likely that the structure extends for a similar distance on the east side of the ruin and will run right up to the edge of the Roman road although lying at a considerable angle to it. There’s more than one of us who can’t wait! 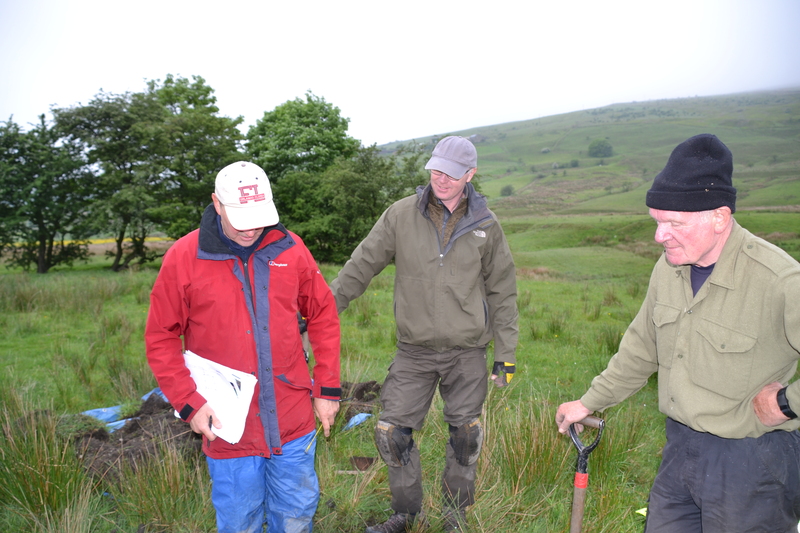 All geophyz assessment and processing by Phil Barrett, assisted by Jane Neild. Photos by Jane Neild. 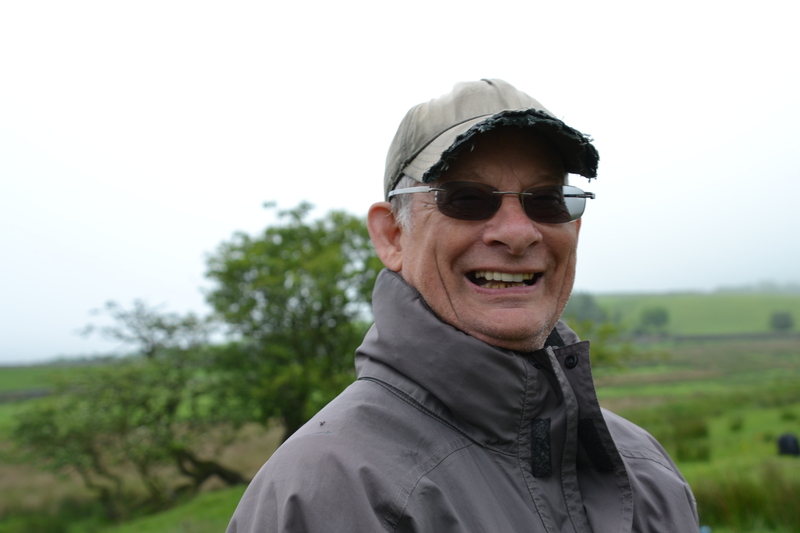 Lead archaeologist Norman Redhead. 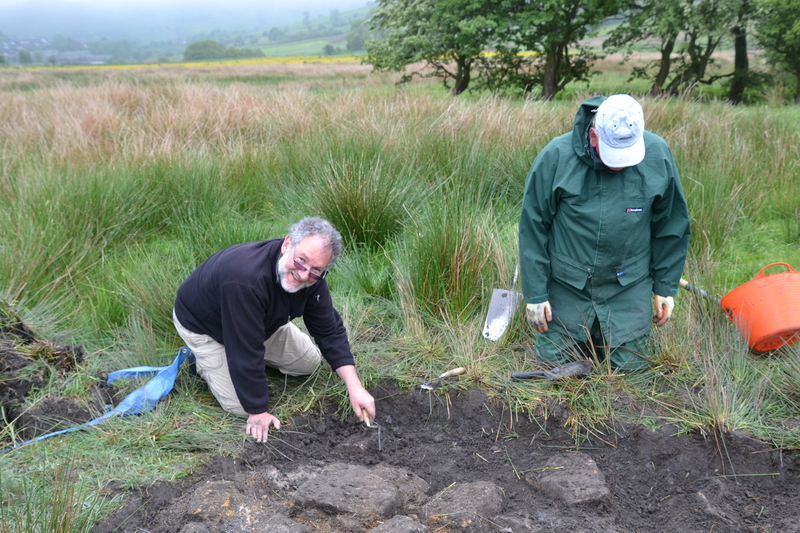 Dig team today: Paul; Jacqui; John; Nora; David; Alan; Jack; Mark. Blog by Bloggerina.